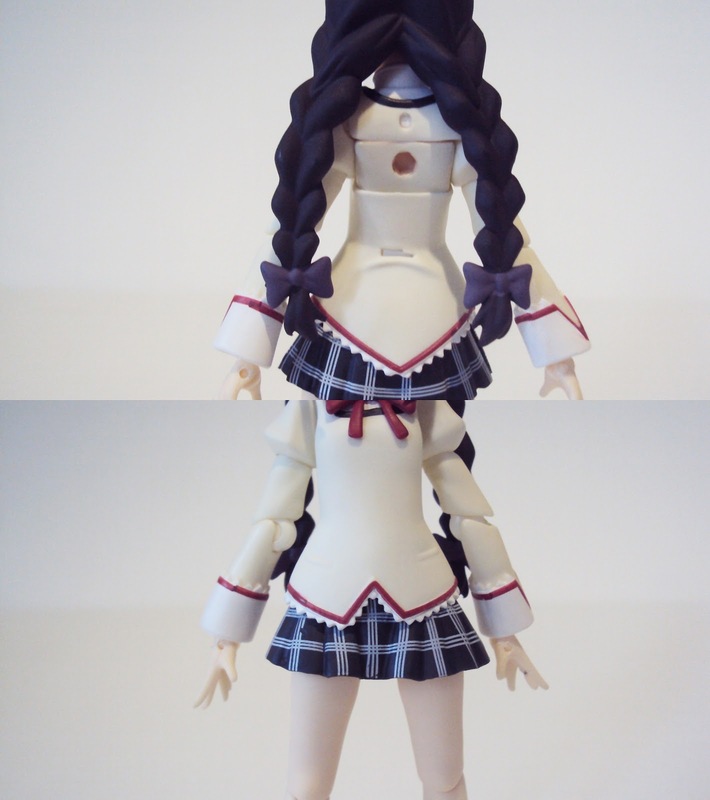 Now the paint work on this figma is not up to the usual standard, the bows on her hair being particularly sloppy. Another interesting thing is that her eye colour is a different shade than that of Devil Homura but I am not sure if this is a continuity error or if that is an accurate depiction. As for the sculpt she is very cute and I like the platting of her hair. Nothing much else to say, she looks good. As for articulation she uses all the standard joints and as per usual in only a few places is her movement restricted by the sculpt. She cannot look up and her head is awkward to move on account of her hair and she has little to no movement bending forward despite having a soft plastic shirt. One thing I noticed and found odd were the two odd shapes cut out of the back of her shirt. Now I looked at her other figma renditions however I could find nothing which might go against her back which would warrant these small shapes - I don't understand why they are there! 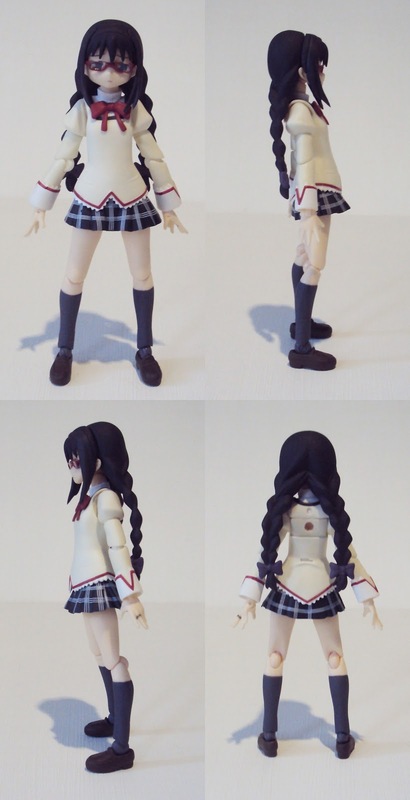 The first accessories Homura comes with are three face pieces, a neutral face, an embarrassed or shy face, and a determined face. She also comes with several pairs of hands, a pair of open hands, fists, hands for holding general items, a hand for holding her rifle, a hand for her rocket launcher, and lastly a pair of hands for holding her bow and arrows. 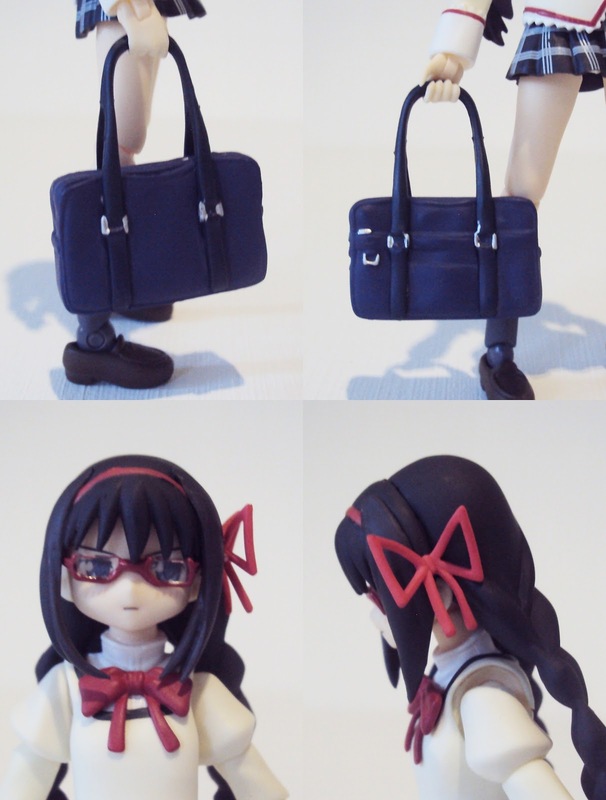 Homura also comes with her school bag, her glasses, and an extra hair piece featuring Madoka's ribbon. 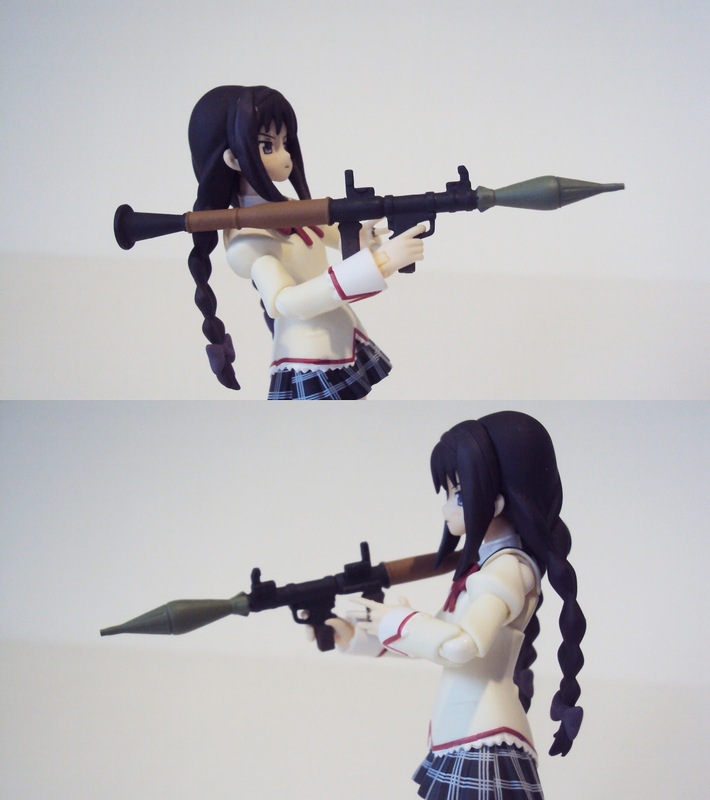 Then there are her two weapons, a sniper rifle and a rocket launcher. 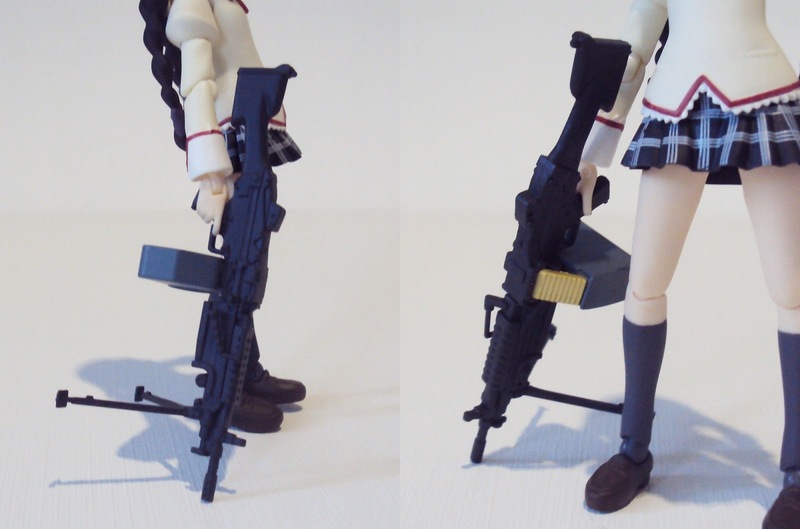 I find the sniper rifle strange though as its pretty much impossible to get her on the ground holding it as one expects a sniper to be able to - if they didn't mean it to be used that way why do they have the stands extended! It just looks odd whichever way she holds it. The rocket launcher however is rather awesome. And lastly is her bow and arrow and here is another strange thing, her hand which is made to hold her arrows is not very effective - there is no way you can get it to hold her arrows as one would when shooting. 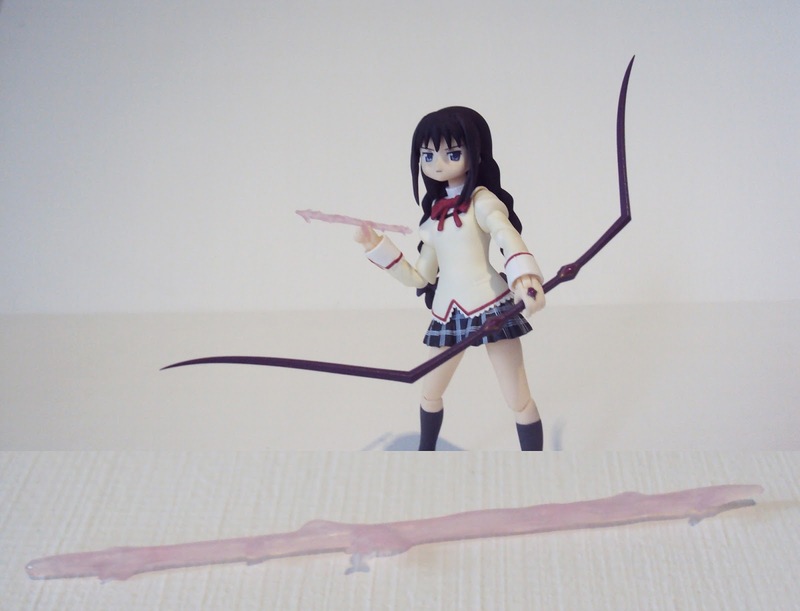 To finish off I will quickly talk about Homura's compatibility with her other figma renditions. 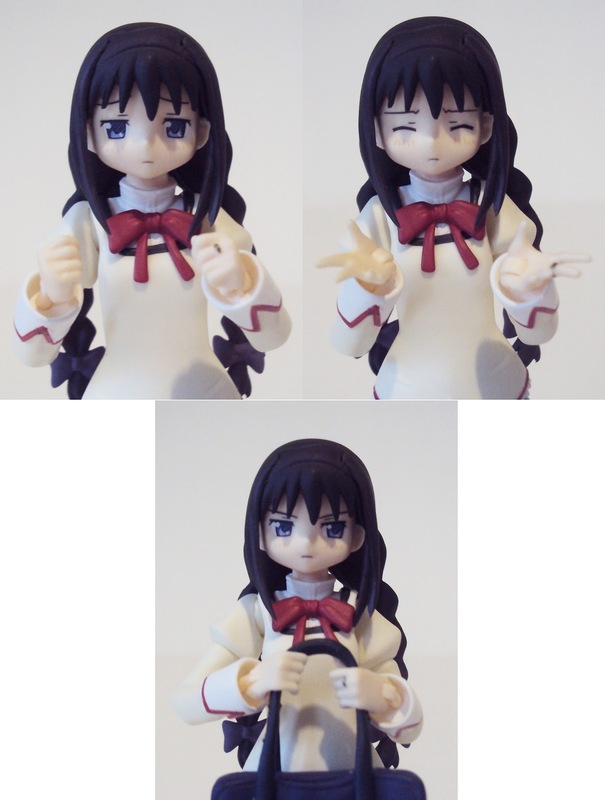 The face pieces can be changed between Homura and Devil Homura. 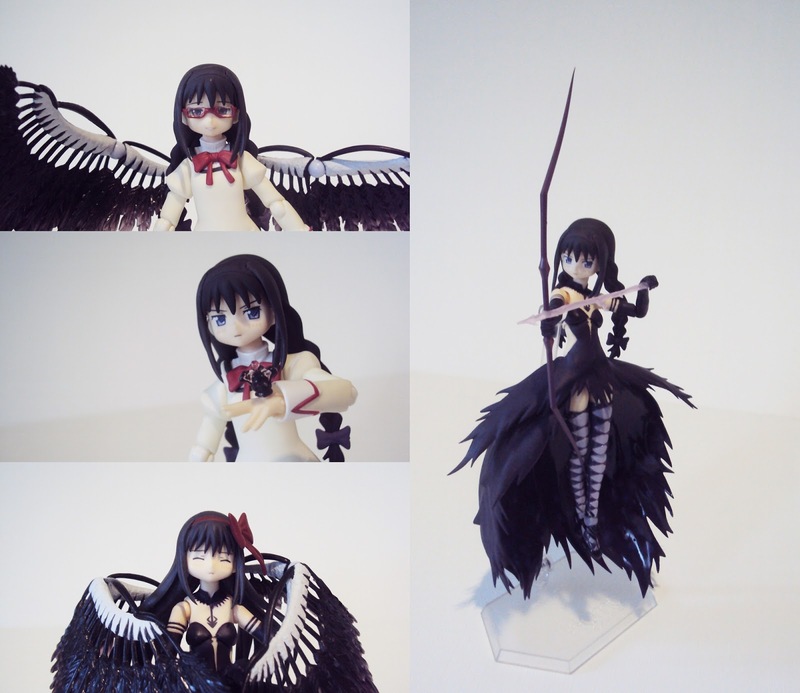 You can also swap heads and wings, however one thing I don't understand is why you cannot swap hair pieces as it would have been nice to have Devil Homura's bow on Homura. Over all I am happy with Homura and she will serve my purposes well, for my comics, however I'm not sure if I would recommend her as she is hard to find at a decent price given the few complaints I had with mine - I wouldn't want someone to be paying premium for her and getting an iffy paint job and odd holes in her back.